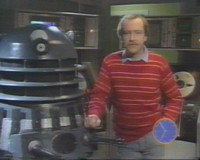 John Nathan-Turner was keen to include a full Dalek serial into season 20 of Doctor Who, seeing as the series had been without them for some four years and so approached Terry Nation, who was now living in the USA, to sound out whether he would be willing to contribute a new script. In the event, Nation was too busy to write anything himself and was reluctant to let anyone else write for his creations having deemed that Douglas Adams had introduced too much comedy into Destiny of the Daleks and belittled them. JNT and script editor Eric Saward persevered, and when Turner met Nation at an American convention, Nation was surprised at his own popularity. He softened his stance and allowed Saward to propose a new story as long as he had approval. Saward rewatched several of the previous Dalek tales but was generally unimpressed with the exception of Genesis of the Daleks. He felt this was grittier and the character of Davros relived the tedium of Dalek speech. Although Saward had disliked Destiny of the Daleks he was keen to reuse Davros and continue the story of the war with the Movellans. In late 1982 the storyline, which Saward felt had a good impact like his Earthshock script, was submitted to Nation for approval. Its early titles included The Return and Warhead. It took Nation some time to respond, and although he was generally happy, there were a few concerns that he wanted Saward to address. 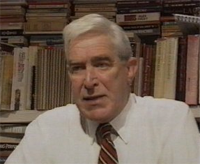 Saward worked quickly to finish his work but in the end a labour dispute at the BBC meant several episodes from other stories were not recorded and they had to be remounted in the time slot that had been allocated to the Dalek story. It was decided that the script could still go ahead but would shift into season 21 with very few changes needed. The title became The Resurrection and then Resurrection of the Daleks which was felt would attract more viewers. 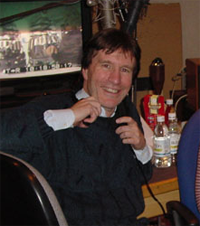 Matthew Robinson was chosen to direct the serial, his style known to have much creative impact. 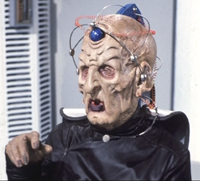 When the idea of a Davros sequel was first mooted, Michael Wisher – the original actor to play the role – was available to return, having missed out on Destiny of the Daleks. However, when the story was postponed to the next season he was unavailable and so actor Terry Molloy was cast in the part. Molloy was most famous for playing Mike Tucker in the long running radio soap The Archers and therefore would bring a distinctive voice to the part. Molloy was small enough in stature for the chair, but the original Davros mask had deteriorated beyond repair following years of display at the Longleat and Blackpool exhibitions. A new mask therefore had to be created. Molloy’s face was cast and a new Davros sculpted. The new design had more of an alien appearance rather than the original wizened, old man of John Friedlander’s mask. The chair also underwent some changes with the top panel adorned with new controls added. The script called for a panel to open in the side of the skirt, and a spring-up section in the dashboard. Dalek One-7Meaning 1 had been most recently used in The Five Doctors and, although still shabby, it needed little work to get it ready. However, the large chip in the original dome (that had been clearly visible in the story) was repaired. The prop also retained its Goon neck cage. The lower shoulder section still remained silver but this time its upper collar and mesh were also given silver finish. Also in good condition was Dalek Six-exMeaning 2 which had most recently been on display at Madame Tussauds and the Longleat convention several months earlier. Dalek Six-ex still retained its ‘Shawcraft style’ neck but the dome had changed so that it now carried the Shawcraft original with the ‘U’ shaped attachment inserted into the pivot hole to prevent the eye from dropping too far. Proper replacement hemispheres were now fitted also where previously only a temporary patch-up had been applied. The last two props were assembled from old components in new combinations. Previously, the shoulders of Dalek Seven had been paired with the skirt of Goon ii for Destiny of the Daleks, but this time it was paired with the skirt of Goon v on which the hemispheres of the front panels were quite haphazard. The prop retained its Goon neck cage and dome although – as with the dome of Dalek One-7 – it had had its eyestalk moved back and its pivot socket filled slightly so the eyestalk couldn’t lower as far. The final prop consisted of the shoulders and neck of Goon v and the original Shawcraft skirt of Dalek Five to make the combination of Dalek v-5. The dome used on this prop was from a Goon and had been used on Dalek Six-ex at Tussauds. The pivot hole remained unmodified on this dome. 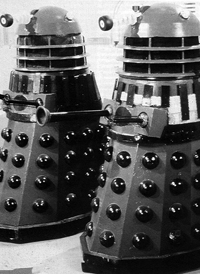 All the Daleks were painted to match the battleship grey of Dalek One-7 (except for the upper collar and mesh which remained dark), and their newly-refurbished eyestalks featured a new disc layout which were now arranged in order of size with the large disc at the rear and small at the front. Interestingly, this new disc arrangement had stemmed from a new arrangement given to Dalek Six-ex when it was refurbished for the Tussauds exhibition and was unique at that time. At this stage the lights of Dalek v-5 were red and orange and the lights of Dalek Six-ex were red. Location filming for the story was covered over the two days of 11th and 12th of September 1983. The area chosen was the distinctive warehouses of Butlers Wharf in the Bermondsy area of London. This was very close to Tower Bridge which was visible in the Tardis landing area. 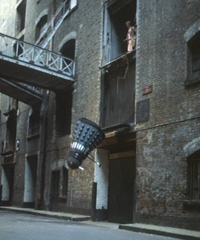 No working Dalek props were needed on location, although one FX prop was required. This was set to explode upon impact when pushed from the upper doors of the warehouse. All the scenes with the regular actors were filmed on the 12th, and during the day a photocall was setup to promote the story and upcoming season. Two Daleks were taken to the location especially for this, these being Dalek Six-ex and Dalek v-5. Studio taping started just over a week after location filming, with the first session running from 21st September until 23rd September. By this time, the lights of all four Dalek props had been modified to match so that they were all the standard clear type. All the scenes requiring the four Daleks in their grey and black livery were recorded in the first session. These included the warehouse scenes and those of the Daleks breaking into the prison ship. For the scenes on the prison ship, Dalek Six-ex was positioned at the back of the four Daleks that storm the barracade and in the centre when the second wave of attack comes after the gas. It appeared briefly again when two Daleks exterminate the crew. These few seconds were the only times it was seen clearly before taking a larger role in the second recording block in two weeks time. For the climatic scenes set in the warehouse two of the lightweight dummies were used to bolster the numbers of Daleks appearing from the Time Tunnel. They were kept at the rear and in semi-darkness so that it was not obvious that they were static and ‘pre-destroyed’. Clever editing also gave the illusion there were more than the four moving props. When the Daleks succumbed to the Movellan virus, a rubber tube was laid between the neck and shoulders of Dalek One-7 through which foam could be pumped to simulate the virus attacking the Dalek. The other Dalek operators forced foam from the neck sections. In the scene where Davros takes control of two of the Daleks, the necks and domes of Dalek One-7 and Dalek Seven-v were modified so they could be tipped forward when commanded to. This had the effect of leaving two small holes, in a diagonal pattern, below the eye pivot hole on the dome. The ‘pre-destroyed’ Daleks were also used at this time to show the after effects of the virus. They were smeared in foam to complete the effect. The script was incredibly action-orientated and a number of other lightweight Daleks were needed to depict Daleks that were destroyed. They were blown up in the same manner as the the FX prop in The Five Doctors whereby air pumps forced the props apart to reveal the Dalek mutant. The final scenes of session one were those set aboard the TARDIS. 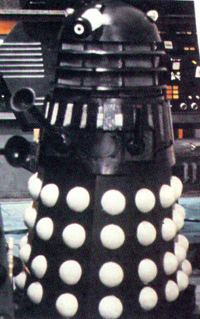 Dalek Six-ex was then repainted into an all-black finish with white hemispheres to become the Supreme Dalek. The prop retained the livery throughout the second session recorded between 5th and 7th October. With Resurrection of the Daleks in the can the focus for the Dalek props became publicising the upcoming anniversary story, The Five Doctors. Blue Peter had been a long time supporter of Doctor Who and it wasn’t surprising that they would feature the show again especially in the 20th anniversary year. Monday 21st November would see one of Blue Peter‘s largest features to date. Not only did they show the the usual compilation of clips but two Doctors (Peter Davison and Richard Hurndall) appeared and a whole parade of monsters including a Yeti, Sea Devil, Axon and Cyberman. The popularity of the Daleks naturally ensured they too appeared, and on this occasion all four main available props were in studio with Dalek One-7 operated by newcomer Steve Roxton. 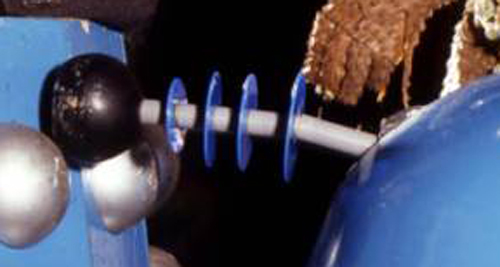 The other three props were were in their Resurrection of the Daleks combinations, with Dalek Six-ex still painted in its black Supreme Dalek finish. Resurrection of the Daleks premiered on BBC1 on 8th February 1984. Expectations were high for the story and fans were hoping that the Daleks would be back to their best after Destiny of the Daleks. On the morning of the first episode, Breakfast Time previewed the story and Dalek One-7 was there to promote the serial. The climax of Season 21 saw a change of lead actor and, in a break with tradition, the incoming Colin Baker was given a full story on which to end. It was decided quickly that the Daleks should face the new Doctor in the very next season. Shawcraft originally numbered their props 1, 2, 3 and 4 and marked them as such. Props 5 and 6 were added in 1964 and Dalek 7 in 1965. We therefore can refer to these simply as Dalek One, and Dalek Two, etc. However, once components began to be mixed together, we had to find an easy short-hand to talk about the different props in their jumbled state. Since the upper half of a Dalek is both the most distinctive and the most frequently seen on camera, we keep this as the primary identifier written as the full word. However, when the wrong skirt becomes swapped over, we append the name of the Dalek with a dash and the number, Hence Dalek One-7 means the top half of Dalek One, with the skirt of Dalek Seven underneath. The “ex” suffix on this prop instead of a number refers to a skirt built prior to The Five Doctors. Famed for its odd appearance it is most commonly associated with exhibitions, hence “ex” for short.